Morden Hall Park is a National Trust park located on the banks of the River Wandle in Morden, south London. 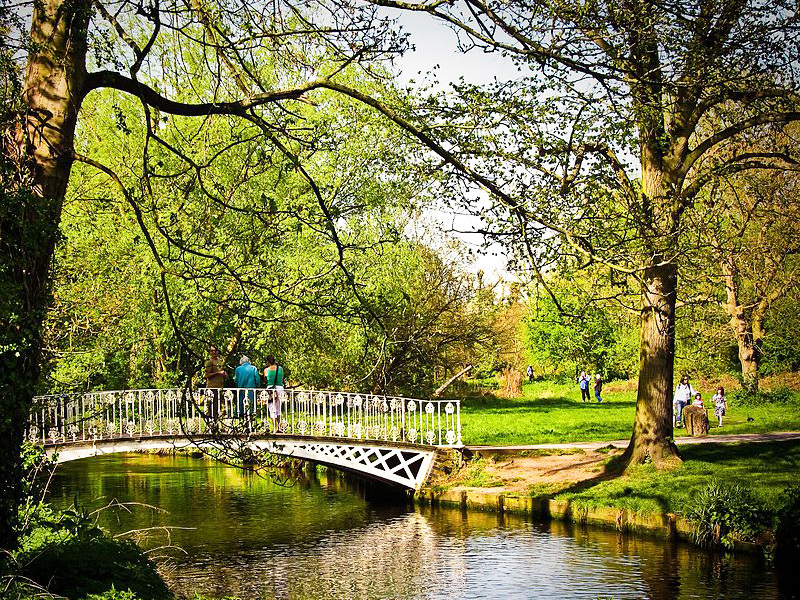 It covers over 50 hectares (125 acres) of parkland with the River Wandle meandering through it spanned by numerous foot bridges. The estate contains Morden Hall itself, Morden Cottage, an old Snuff Mill, and many old farm buildings, some of which are now a garden centre and a city farm. 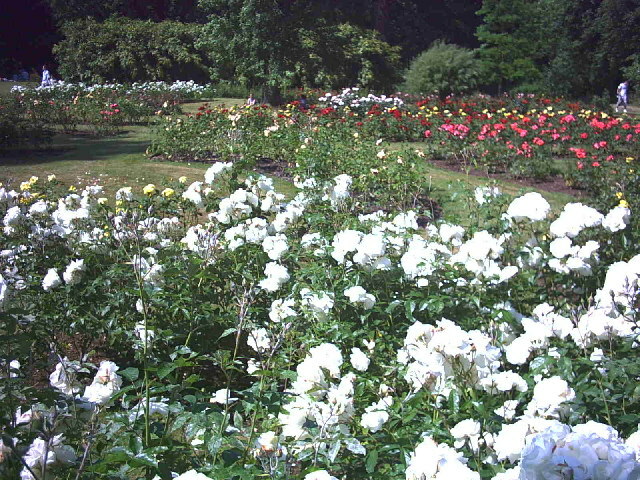 The rose garden has over 2000 roses. The estate land was originally owned by Westminster Abbey. There is evidence of an earlier manor-house, but the Hall dates back to the 1770s and contains a variety of natural landscapes, including the parkland of the "Deer Park", meadow and marshland. A number of historic buildings are located in the park, including the Hall itself and preserved watermills where tobacco was once ground into snuff. The Hall was owned and occupied by the Garth family for generations. It was occupied, as a school, for young gentlemen about 1840, until it was sold by Sir Richard Garth to a tobacco merchant Gilliat Hatfeild (1827–1906) in the 1870s. The Hall was a military hospital during the First World War. Gilliat Hatfeild's son, Gilliat Edward Hatfeild (1864–9 February 1941), left the core of the estate (including the house) to the National Trust, when he died. The Hall is now an exclusive Wedding Venue, offering a beautiful location together with fine foods and drink. It had previously been a Whitbread plc owned restaurant. Gilliat Edward Hatfeild lived at the nearby Morden Cottage which he considered better suited to his life as a bachelor. The formal garden of the cottage is surrounded by an unusual collection of ornamental trees, including one of the oldest yews in England. Outside of the main park, the remainder of the estate has been swallowed up in housing developments stretching between Morden, South Wimbledon and Collier's Wood and an industrial estate at Deer Park Road. A much-loved rural idyll, the park lies in a built-up area, and some of the surviving estate buildings are used as workshops by local craftspeople and artisans. The renovated Stable Yard is the heart of the park with a café, second-hand bookshop and a living green centre with exhibitions. When you step through the gates, you'd be forgiven for imagining yourself to be in the middle of the English countryside. Surrounded by meadows, trees and the gentle sounds of birdsong and running water, the park offers a rare sense of discovery and a chance to get away from it all. Accessible parking is in the main car park, 150 yards away. There is an adapted toilet in the café and Snuff Mill (when open).The grounds are partly accessible, loose gravel paths. Rose garden is fully accessible. Map of accessible routes is available. All-ability trails - the Wandle Trail takes you along a well-maintained, flat path through the park, visiting meadow and wetlands along the way. There is Seating along the avenue in the park. The Shop entrance is level and accessible. Refreshments entrance is level and accessible. The Snuff Mill - ground floor accessible. Wheelchairs can be borrowed from the café on production of a National Trust membership card or small deposit. Visual Information - a braille guide to the Park is available at the shop. Deaf/hard of hearing - there are induction loops in the café, shop and Snuff Mill. The main entrance to the park is a short walk from Morden town centre, and car parking is available at the main entrance. The Snuff Mill and Riverside Café are adjacent to the main entrance. The Tramlink light rail line from Wimbledon to Croydon, Elmers End and New Addington runs through the northern part of the park, and Phipps Bridge and Morden Road tram stops give access to the park. Transport: Morden (Northern Line). Bus routes 80, 118, 157, 164, 201, 470 and 93 stop outside park. Opening Times: March to October 08:00 to 18:00. Opening Times: November through February 08:00 to 17:00.